The MiniCore™ family is ideally suited for cost sensitive applications as each module packs a rich embedded feature set on an ultra-compact mini PCI Express form factor. As an added benefit the MiniCore RCM5700 offers the lowest profile of any embedded solution giving it an unprecedented flexibility to place network connectivity into any new or existing application. With up to 6 serial ports and 32 I/Os the RCM5700 provides a single connection point to multiple devices allowing for greater control and monitoring. The MiniCore RCM5700 family offers a solid cost-competitive solution in a small package. Base versions of the RCM5700 offer a cost-effective starting point for your embedded development, while the more feature rich RCM5750 and RCM5760 models allow you to use more memory and update firmware from anywhere in the world. With six serial ports, four configurable as SPI, the RCM5700 can easily embed into any existing or new design and is pin-compatible with current and future MiniCore products, such as MiniCores offering Wi-Fi 802.11b/g. The embedded web server offers an added level of control and monitoring for today’s intensive applications. To evaluate and learn more about the MiniCore RCM5700, please visit www.rabbit.com/products/rcm5700/. The MiniCore RCM5700 modules are pin compatible with the current RCM5600W Wi-fi products and future versions of MiniCore products. This gives any application the flexibility for interchangeable networking options. The RCM5700 series also has the option to include the RJ-45 jack ideal for getting your products to market quicker. The MiniCore allows for remote firmware updates on the RCM5750 and RCM5760 which not only reduces maintenance costs but with increased memory configurations the modules can also function as compact data loggers. 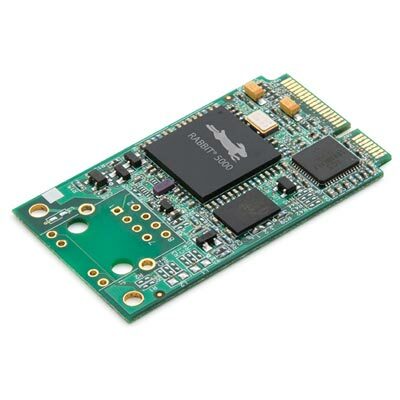 Rabbit’s MiniCore modules are designed to facilitate rapid development and implementation of embedded systems. Develop programs with our industry-proven Dynamic C® integrated development environment, a C-language environment that includes an editor, linker, loader and compiler. Download the program from your PC via USB or serial port, and debug right on the target hardware – no in-circuit emulation is required. This environment reduces effort and accelerates hardware and software integration. Rabbit provides an extensive library of drivers and sample programs, along with royalty-free TCP/IP stack with source. There are two options for a development kit to get you started developing and testing software. The Standard Development Kit has the essentials that you need to design your own microprocessor-based system, and includes a complete Dynamic C software development system. The RCM5700 Standard Development Kit also contains an Interface Board that will allow you to evaluate the RCM5700. The Deluxe Development kit includes Digital I/O and Serial Communication accessory boards to help illustrate the RCM5700 features by running additional sample programs included with Dynamic C. You will also be able to write and test software for the RCM5700 modules, including Ethernet or TCP/IP applications. Universal AC adapter, 5 V DC, 2 A (includes Canada/Japan/U.S., Australia/N.Z., U.K., and European style plugs). Digital I/O and Serial Communication accessory boards for use with certain sample programs.